In this second part of the book, we wish to obtain index formulas for nonlocal elliptic operators. 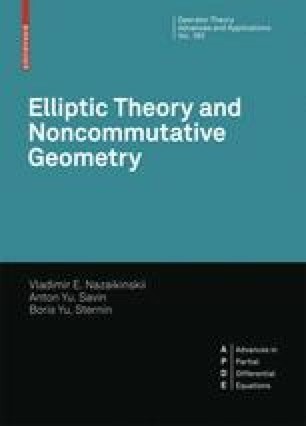 By analogy with the classical situation of elliptic operators on closed manifolds considered by Atiyah and Singer, the study of this problem naturally starts from establishing the homotopy classification of elliptic operators. It is well known that in the classical case this classification is given by the K-group with compact supports of the cotangent bundle. Our situation differs from the classical situation in that the algebra of symbols is bigger (and already noncommutative): it is obtained as the crossed product of the classical algebra of symbols by a discrete group Г. Hence it is no miracle that the homotopy classification in this case is similar to the classical one. Namely, it is given by the K-group of the crossed product of the algebra of functions on the cotangent bundle by the group Г. In this chapter, we give a detailed account of this result.